Contracts, policies, and live HR chat support - whenever you need it. From just £199 a month. When a problem arises, we know you need an answer fast and from someone you can trust. Talk to a qualified HR professional who will get you the answers you need to protect your business and help your employees. We provide expert guidance via phone, chat or email to ensure difficult situations are managed effectively, efficiently and within the law. All the documents you need, prepared bespokely for your company and kept up to date as requirements change. 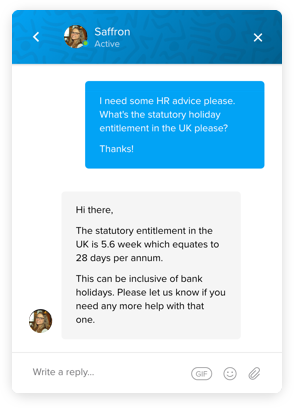 HR Advice is purchased as a one – year contract. What qualifications does the HR Advisor have? Our HR Advisor is fully CIPD qualified. There is no limit to the number of times you can contact the HR advisor. We do not currently provide indemnity insurance at this time. When is the HR Advisor available? Our team are live Monday to Friday, 10am to 6pm GMT. Right now we only provide UK specific advice.